Featuring 39 winning combinations and the Dollar Ball Jackpot game exclusive to Playtech. Enjoy the thrilling adventures of the brave, fearless pirates where you can also participate in a treasure hunt. 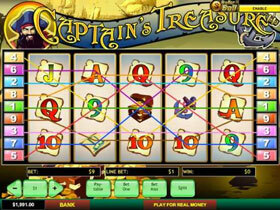 This game is ideal for beginners or ‘low rollers’ who don’t want to gamble too much. Starting with a minimum bet of 0.01 up to the maximum bet of 5.00 per spin. There is also a choice to bet one coin per pay-line. Symbols include a Treasure Map, Captain, Anchor, Wheel and Swords. The regular playing cards from 9 to Ace are also included. The Captain symbol will appear only on the 2nd, 3rd and 4th reels. The Captain substitutes for all other symbols to create a winning combination. The Wild also ‘Doubles’ the payout of any winning combination completed as a substitute symbol. Unlike other games, the Wild may also substitute for the scatter symbol. The Treasure Chest may show up anywhere on the reels. The Scatter winning combination will be complete when the Treasure Chest appears more than twice. This winning combination awards a payout of 1x, 5x, 10x and 100x the triggering bet, depending on the Treasure Chest appearing 2x, 3x, 4x or 5x. 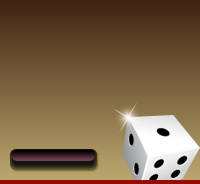 This is a Lotto-type progressive side game, players are not required to play this game. Start by picking 5 numbers out of 49. Once the main game begins, 5 numbers will be randomly drawn. Try to match the numbers, the more that match the more you win. All 5 numbers need to match in order to win the Dollar Ball Progressive Jackpot. After the Jackpot has been won, a new pot will be started, with the casinos contributing a base amount of money – which is called a seed. This game offers a No Download version where no special software is required. Play for Free to practice, or play with Real Money to stand a chance of winning. The sounds and graphics are fun, exciting and authentic. This is a very popular game, which can be enjoyed by everyone.